Goal setting is a powerful technique that provides a direction for your efforts, focuses your attention, promotes persistence, and increases your confidence. 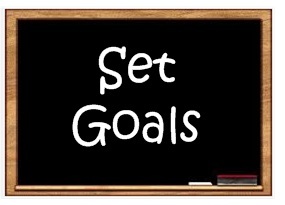 Goal setting gives you a long-term vision of where you want to be, steps to get there, and the motivation to begin. It essentially focuses your attention on what you really want to achieve, and helps you organize your time and your resources so that you can make the most out of your life. Goal setting is a process of identifying what you want to accomplish and creating a plan to achieve those desired results. By setting goals on a routine basis, you decide what you want to achieve, and then you systematically move towards the achievement of those goals. Goals provide you with a focus for your life. By setting goals, you create a rippled effect. The process of setting goals gives you a purpose and direction in life by allowing you to choose where you want to go in life. By clarifying your expectations and by challenging yourself, you become more intrinsically motivated. You force yourself to focus on the acquisition of knowledge and to organize your resources, thus allowing you to become more organized and effective. As you become more effective, you can improve both your decision making and performance. As your performance increases, you achieve more and your self-confidence increases. An increased self-confidence leads to being happier and feeling more fulfilled in life. Having no goals is like going on a trip without a map: When there is no destination, vision, or plan, most people tend to drift. However, when people have a vision of where they want to go, they tend to feel a greater sense of commitment than they would without having the vision. By creating goals, you create a long-term vision. You give yourself a sense of purpose and you provide yourself with a focus. By concentrating your energies and thoughts on your goals, you are better able to use time-management strategies and this in turn enables you to achieve more. Specific – Set specific goals that are fairly detailed. Do not set a goal to “lose weight”, set a goals to “lose 24 pounds.” Goals that are specific help us to focus our efforts and clearly define what we are going to do. If a goal is too vague, it is hard to measure or determine if you are successful in reaching it. Measurable – Establish criteria for measuring the progress toward the attainment of each goal you set. Do not set a goal to “run faster,” but rather set a goal to “run a mile in 6 minutes.” If it is not measurable it will become almost impossible to tell if you are successful or to take the goal to the next level. Attainable – Set goals that you can attain. If a goal is not attainable, you may lose motivation and fall short of your goal. You may also lose some self confidence. Relevant – Set goals that you will feel good about attaining or achieving that is relevant to your life. Relevant goals provide intrinsic motivation to achieve them. If a goal is not rewarding or relevant you may loss the desire to achieve it. Time bound – set a date on when you plan to achieve your goal. Do not set a goal to simply “lose 24 pounds,” set a goal to lose 24 pounds by November 1.” Without a specific date for completion, you may lose your commitment to achieving it. The first step of this goal setting process begins by picturing the future as it will be when you achieve your goal. Then accept and assume the fact that you will attain the goal. The next step is visualizing yourself achieving the goal and allowing yourself to feel the positive emotions associated with achievement. Adding emotion to your visualization is very powerful. Lastly, use your powers of expression to cement your commitment to your goal by telling others, writing it down, drawing a picture, painting, or creating an image, and any other creative expression. The SAFE method is especially good for those who that need to have the big picture in order to accept the fact that they can accomplish their goals. Our Tool Box provides goal setting sheets and other worksheets and reference guides to help achieve goals.